The X-4 Tool TD-2500 Torque Multiplier provides up to 12,000 ft-lbs of output torque and features a 1”square input drive, 2-1/2” square output drive and 6 to 1 multiplication factor. The X-4 Tool Torque Multiplier is unlike any other tool providing the power needed to loosen the toughest threaded fasteners. Relatively small in size, X-4 Tool Torque Multipliers may be used with practically all drive tooling to provide increased output torque in work areas where accessibility is limited. Using an X-4 Tool Torque Multiplier greatly improves productivity as in many cases it eliminates the need to disassemble nearby equipment to access stubborn fasteners. 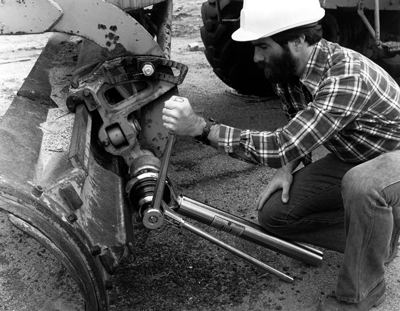 Equipment operators and service technicians as well as maintenance and production personnel regard X-4 Tool Torque Multipliers as indispensable tools necessary to keep their operations up and running under the most demanding conditions. Thousands of Geartronics X-4 Tool Torque Multipliers are used every day in a variety of industries throughout the world in countless applications. Using the X-4 Tool TD-2500 Torque Multiplier is quick and easy. Simply, attach any appropriately-sized standard drive socket to the 2-1/2” output drive square of the torque multiplier. Then, insert the drive end of a ratchet, breaker bar, torque wrench or other standard drive tool into the 1” input square of the multiplier. (Please note that impact type driving tools SHOULD NOT be used.) Place the torque multiplier assembly on the fastener with the reaction bar securely restrained against a fixed object or surface. Any force applied to the drive tool is multiplied by six times at the output end of the X-4 Tool TD-2500 Torque Multiplier. For higher ratios of multiplication, two or more torque multipliers may be directly coupled. This photo shows the possibilities for and advantages of using X-4 Tool Torque Multipliers in tandem. The technician is using the output torque generated by an X-4 Tool model TD1000 to provide the input torque to drive an X-4 Tool model TD2000 resulting in a multiplication factor greater than 13X (when taking efficiency losses into consideration). In this particular application, 50 ft-lbs of torque applied by the technician would result in more than 650 ft-lbs of torque applied to the fastener! X-4 Tool Torque Multipliers have proven to be both invaluable and essential tools for remote field applications. CAUTION: Do NOT, under any circumstances, exceed the rated output capacity of the device. Subjecting the device to output torques higher than the maximum rated capacity may result in tool failure and personal injury. When using torque multipliers in combination only the multiplication factor is increased; the maximum output capacity is limited to that of the multiplier having the lowest rated output in the stack.